Bohol has a number of very old churches, dating back to the early years of the Spanish colonization of the island. On October 15, 2013, a 7.2 magnitude earthquake destroyed the churches of Loon, Maribojoc, and Loboc, and heavily damaged most other historic churches in Bohol. In memory of those churches, I will be placing my collection of photographs on my facebook account. More images of the churches of Loon, Loboc, Baclayon and Calape are already available. I invite everybody with detailed photographs that can be used to document those churches to share them as well. The Church of Our Lady of the Immaculate Conception in Baclayon is considered to be one of the oldest churches in the Philippines. It is one of the best preserved Jesuit build churches in the region, although in the 19th century, the Augustinian Recollects added a modern facade and a number of stone buildings that now surround the church. 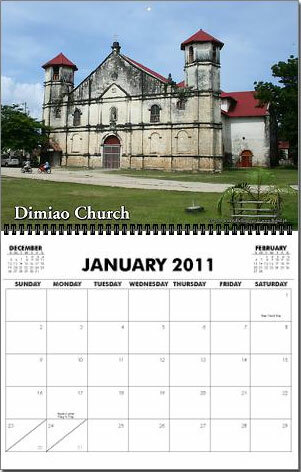 Bohol monuments calendar, USD 19.99. The first Spanish missionaries or doctrineros in the region, Fr. Juan de Torres and Fr. Gabriel Sanchez, first settled in Baclayon in 1595. Shortly after their arrival, a visita was erected on the spot. Although Baclayon was the first seat of the Spanish Jesuit missionaries, fear of Moro marauders soon forced them to move their headquarters more inland, to Loboc. Only in 1717, Baclayon became a parish, and construction of a new church commenced. Some 200 native forced laborers constructed the church from coral stones, which they took from the sea, cut into square blocks, and piled on to each other. They used bamboo to move and lift the stones in position, and used the white of a million eggs as to cement them together. The current building was completed in 1727. The church obtained a large bell in 1835. In the Baclayon church is a dungeon, which was used to punish natives who violated the rules of the Roman Catholic church. Next to the church is the old convent, which also houses a small museum with centuries-old religious relics, artifacts and other antiquities, dating back to the 16th century. Included in the collection are an ivory statue of the crucified Christ looking towards heaven; a statue of the Blessed Virgin, said to be presented by Queen Catherine of Aragon; relics of St. Ignatius of Loyola, old gold embroidered ecclesiastical vestments, books with carabao skin covers, and librettos of church music written in Latin on sheep skins. Here you can also find the cuadro paintings made by the Filipino painter Liberato Gatchalian in 1859. Getting there. Baclayon is some 6 km east of Tagbilaran. Catch a bus or jeepney in Tagbilaran, going into the direction of Baclayon. You may also find a tricycle willing to bring you there. The Church of San Pedro in Loboc is the second oldest church in Bohol. It was originally built in 1602, but soon reduced to ashes. In 1638, a stronger one was build. Located near the river, it has survived a number of floods. Inside the church, you can admire some remarkable naive paintings on the ceiling. A Spanish coat of arms can be found in the stone wall near the entrance of the convent. The bell tower of Loboc is about 100 meters from the church. Attached to the building is a three storey convent, which today houses the Museo de Loboc on the third floor. This museum houses a few old statues of saints, and some other antique religious artifacts. In Loboc, you can also admire a shameful witness of wasteful planning. Exactly next to the church is a partly finished bridge across the river. Hopefully, this bridge will never be completed, as, to do that, the Church will have to be destroyed. Getting there. Loboc is 21 km east of Tagbilaran. Catch a bus to Loboc, or one in the direction of Carmen, and ask the driver to drop you off at the church. The Church of Our Lady of Light in Loon is the biggest church in Bohol. At the spot of the current church, a chapel was constructed during the term of Fray Manuel de Elizalde in 1753. Some fifty years later, the Augustinian Recollects replaced by the current church in Ionic and Corinthian style. The building has two towers octagonal bell towers, and is fully symmetric. From Loon Church leads of long stairway of 174 stone steps, which connect Napo, the former seat of the town. Wood to build the church was carried from the forest of Maitum by forced laborers, who had to beat their way through uncharted trails and across rivers. Getting there. Loon is some 25 km north-west of Tagbilaran City, along the route to Tubigon. Catch a bus to Tubigon from the Integrated Bus Terminal and ask the driver to let you out in Loon. Another beautiful church in Bohol is the Church of Our Lady of the Assumption in Dauis, on the Island of Panglao. It is located not far from the bridge that connects Panglao with Bohol. The church was founded by the Jesuits Fr. Diego de Ayala and Joseph Gregorio. The church is build in a mixture of styles, influenced by both Byzantine and Romanesque architecture. Inside, on the ceiling, are some impressive frescoes painted Ray Francia in 1916. Lito Arraya renovated the building in 1970. The church's patron saint, the Virgin of the Assumption, is said to possess miraculous powers. An old legend relates that once, when the town was invaded by pirates, the people of Dauis locked themselves into the church. However, they soon ran out of provisions and water. Then a miracle occurred: a well appeared at the foot of the altar. This same well is still the main source of water for the people living close to the church, and, although the well is only a few meters from the sea, the water is absolutely fresh. The water is said to have healing powers, so, if you're visiting here, don't forget to bring a bottle and take some home. Getting there: The church is a nice three kilometer walk from Tagbilaran city. Alternatively, you may catch a tricycle or jeepney to bring you across. The parish of Maribojoc was founded in 1768, and construction of a church started 1798 and lasted 18 years. Getting there: The church is located in Maribojoc town, 14 kilometers from the Tagbilaran. The place can be reached by bus of jeepney. The church of Panglao is located on the south-western side of Panglao Island, 18 kilometers from Tagbilaran. The church is noteworthy because of its twin antique confessionals carved with grape and dove patterns. Its ceiling murals depict the sacraments. The National Commission for Culture and the Arts published a 123 page book with a description of the over 40 churches on Bohol. This book, Visita Iglesia Bohol: A Guide to Historic Churches by Jose Regalado Trota, includes a short historical introduction of each church, and continues with a tour around the church complex. Includes black and white pictures. This book includes a lot of interesting details. It was named by the Philippine Headline News as one of the most charming books of 2001. This article has been viewed 1311 times.